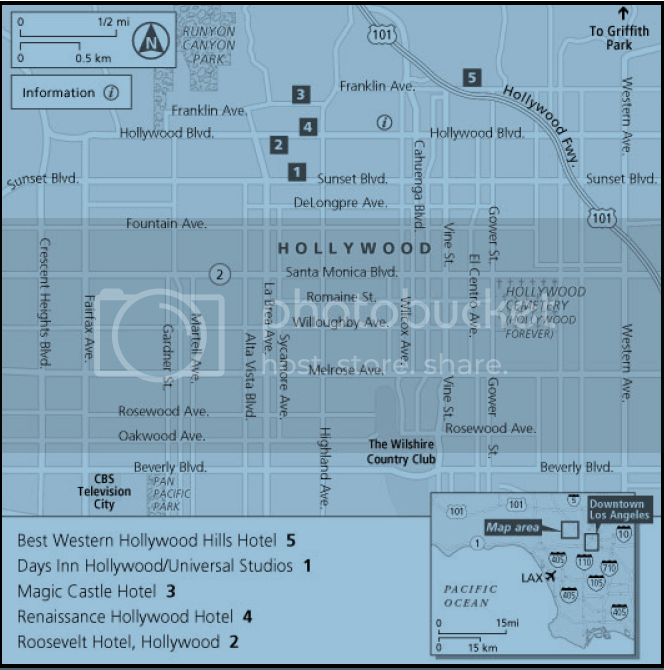 Hollywood is a neighborhood in Los Angeles, California - situated west-northwest of Downtown Los Angeles. Due to its fame and cultural identity as the historical center of movie studios and movie stars, the word "Hollywood" is often used as a metonymy of American cinema, and is often interchangeably used to refer to the greater Los Angeles area in general. The nicknames StarStruck Town and Tinseltown refer to Hollywood and its movie industry. Today, much of the movie industry has dispersed into surrounding areas such as the Westside neighborhood, but significant auxiliary industries, such as editing, effects, props, post-production and lighting companies remain in Hollywood, as does the backlot of Paramount Pictures. Many historic Hollywood theaters are used as venues and concert stages to premiere major theatrical releases and host the Academy Awards. It is a popular destination for nightlife, tourism, and is home to the Hollywood Walk of Fame. Although it is not the typical practice of the city of Los Angeles to establish specific boundaries for districts or neighborhoods, Hollywood is a recent exception. On February 16, 2005, California Assembly Members Jackie Goldberg and Paul Koretz introduced a bill to require California to keep specific records on Hollywood as though it were independent. For this to be done, the boundaries were defined. This bill was unanimously supported by the Hollywood Chamber of Commerce and the Los Angeles City Council. Assembly Bill 588 was approved by the Governor of California on August 29, 2005, and now the district of Hollywood has official borders. The border can be loosely described as the area east of Beverly Hills and West Hollywood, south of Mulholland Drive, Laurel Canyon, Cahuenga Boulevard, and Barham Boulevard, and the cities of Burbank and Glendale, north of Melrose Avenue and west of the Golden State Freeway and Hyperion Avenue. This includes all of Griffith Park and Los Feliz—two areas that were hitherto generally considered separate from Hollywood by most Angelenos. The population of the district, including Los Feliz, as of the 2000 census was 123,436 and the median household income was $33,409 in 1999. Hollywood is and always will be Carthian Territory. Its currently run by the Duke of Hollywood Jackson Shartrou. Hollywood for the kindred will be buttoned up for decades to come. The Carthians maintain the sunset as one of the best Racks in the city but ban anyone they see as an enemy from feeding there, otherwise anyone is allowed as long as they dont break the rules. For the changelings Hollywood is a goldmine, A veritable well of glamour for desire, sorrow, and anger. People come from around the world to get into acting, writing, or just to see the sites, and the lost just ride the wave drinking in the magic.